Democratic National Committee chairman Tom Perez said Wednesday that Republicans are trying to "trample on our most sacred freedoms." The comments were part of Perez's Time magazine op-ed written in response to President Donald Trump's Voter Integrity Commission. 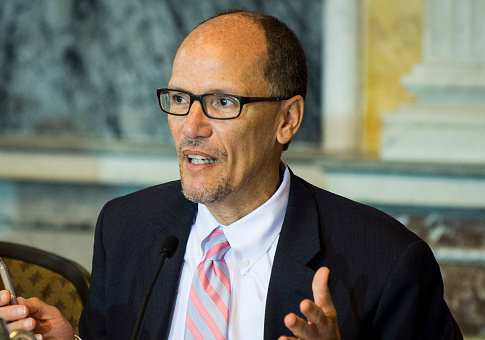 "There seems to be no limit to how far Republicans will go to disenfranchise certain voters," Perez said. Perez called Trump's commission a "propaganda factory" with a true purpose of "justifying the Republican Party’s broader vote suppression efforts." Trump established the panel after claiming that millions of non-citizens voted in the 2016 election. The president's sweeping claims have remained unsubstantiated. Some level of voter fraud is legitimate, however, as instances of fraud have continued to come to light. The panel's self-described purpose is to "protect and preserve the principle of one person, one vote." The panel has received strong criticism from Democrats, and in July, many states refused to share "publicly available" voter information with the panel. Multiple states expressed concerns over voter privacy and voiced the preference and right of states to conduct their own electoral processes. Perez claimed that Republicans were actively trying to suppress American citizens from voting in order to help win elections, arguing that Trump's panel is simply another measure to prevent votes that might not serve Republicans. Perez cited redistricting and the establishment of voter ID laws, actions that he argues have unfairly affected minority groups, who often vote for Democrats in high numbers. The DNC chair cited the left-leaning Brennan Center for Justice, which found that 14 states added new restrictions on voting that went into effect for the 2016 election. He said that none of those measures were signed by Democratic governors and called them "a disgraceful attack on African Americans, Latinos, working families, students, first-generation Americans, and the elderly." "Instead of working to convince voters to support their policies, they're working systematically to suppress the fundamental democratic rights of the American people," Perez wrote. Republicans have argued that some voting requirements are "common sense." Following the 2016 election, Republican lawmakers spoke out in favor of reform. In late January, Virginia Republican Del. Bob Marshall argued in favor of a bill that would require voters to provide proof of citizenship before casting ballots in state and local races. "I've identified individuals who tell me they're not citizens, but they're on the voter database," Marshall said. New Hampshire state Sen. Regina Birdsell (R.) supports the implementation of additional voter requirements. "I call it trust but verify," he explained. Perez, however, argued that documented cases of voter fraud are few and far between, making the voter fraud panel irrelevant at best. "You're more likely to see someone fatally struck by lightning than witness a case of in-person voter fraud," Perez said. He further claimed that the actions by Republicans have nothing to do with voter fraud. "This isn't a war on voter fraud," he claimed. "It's a war on voters — and it's only being waged by Republicans." Perez continued by outlining how the DNC will respond. That response includes the creation of a DNC commission to directly "address and combat Trump's." "Their mission will be to expose the White House's voter-suppression scheme and correct the record with facts," Perez explained. Also on the DNC agenda: Expand the Civic Engagement and Voter Participation Department at the DNC, "re-imagine and re-launch" the DNC Voting Rights Institute, and support campaigns that are committed to "ensuring fair and impartial elections." "We'll work to advise campaigns as they fight voter suppression cases in court, and we'll support candidates for secretary of state, attorney general, and other election offices that are committed to protecting the integrity of our democratic process by ensuring fair and impartial elections," Perez said. Perez concluded by saying that Democrats must act while "Republicans try to trample on our most sacred freedoms." "We can't afford to let down our guard for a moment, because the difference between Democrats and Republicans on the issue of voting rights could not be clearer," he said. This entry was posted in Politics and tagged Democratic Party, DNC, President Trump, Republican Party, Republicans, Tom Perez, Voter Fraud. Bookmark the permalink.